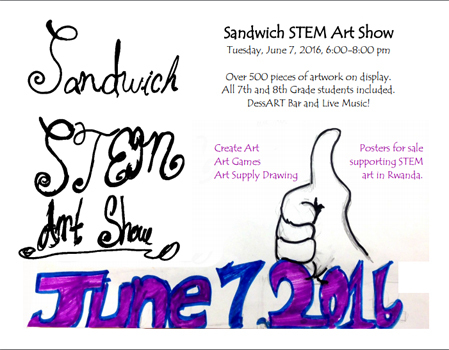 The Sandwich STEM Academy will be holding the 2nd Annual STEM Art Show on Tuesday, June 7 from 6:00-8:00 pm. Over 500 pieces of artwork from our 7th and 8th grade students will be exhibited in galleries on the 1st floor. In addition to experiencing the artwork, guests may also enjoy student musical performances, art games, art activities, and “DessART” Bar. Goals of art education at the STEM Academy include encouraging creative thinking while making a positive impact on our world. This year, the Art Show is expanding in order to support these goals. As a result of student requests for more art supplies at home, we will be holding an art supply raffle for students. To demonstrate how art can make a difference in the world, the art club will be selling a collaborative art poster to support the “Art and Literacy Project in Rwanda”. This project provides the means for taking Art Club alphabet tiles to Rwanda and building an alphabet wall in an elementary school. Our students are discovering that they do have what it takes to be inventive, imaginative and creative. We want to share that with you. Please join us, bring your friends and family for an evening of inspiration and thought-provoking ideas.